In stock -This product will ship today if ordered within the next 4 hours and 2 minutes. Natures Plus Source of Life Women Multivitamin & Mineral is a special formulation created to address the unique needs of a woman`s body. 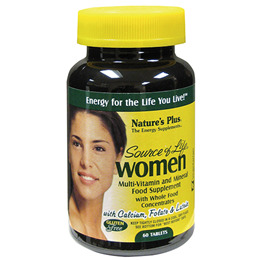 Source of Life Women supplies finely balanced quantities of key nutrients to optimally support women`s health and well-being at every stage of life. This gender specific supplement features soy isoflavones. Like all varieties of Source of Life, Source of Life Women has complete profiles of naturally derived essential vitamins, minerals, enzymes and amino acids. Source of Life Women contains a broad spectrum of energizing, nutritious whole food concentrates, bioflavonoids and botanical extracts, providing multiple forms of support for general well-being. Calcium (As Citrate; Aqueous-Blended Calcium Carbonate And Hydrolysed Rice Protein), Magnesium (As Citrate; Aqueous-Blended Magnesium Oxide And Hydrolysed Rice Protein), Ascorbic Acid, Spirulina, Bulking Agent (Microcrystalline Cellulose), Vegetable Cellulose, Iron (As Aqueous-Blended Ferrous Sulfate And Hydrolysed Rice Protein; Ferrous Gluconate), Fem-Plex Complex, Zinc Monomethionine, Kelp (Ascophyllum Nodosum), Choline Bitartrate, D-Alpha Tocopheryl Acid Succinate, Calcium Pantothenate, Thiamin Hydrochloride, Riboflavin, Niacinamide, Pyridoxine Hydrochloride, Lubricant (Stearic Acid, Magnesium Stearate), Bee Pollen, Glazing Agent (Pharmaceutical Glaze), Novasoy, Potassium Iodide, Inositol, Biotin, Lemon Peel, Copper Citrate, Cyanocobalamin, Boron Citrate, Phytonadione, Lipase, Thyme Leaf, Rice Bran, Irish Moss (Chondrus Crispus), Barley Leaves (Hordeum Vulgare), Beta Carotene, Pineapple Fruit, Turmeric, Bilberry, Green Tea (Decaffeinated), Lutein, Ergocalciferol, Manganese Citrate, Folic Acid, Chromium Chloride, Sodium Selenite. As a food supplement for women only, one tablet daily. This product is not a substitute for a varied diet. Below are reviews of Natures Plus Source of Life Women Multivit - 60 Tablets by bodykind customers. If you have tried this product we'd love to hear what you think so please leave a review.